I’ve been in Portland for 5 days now, and have managed to get a lot accomplished. I’m pretty sure I’ve found a place to live. You might be able to tell, it is pretty close to the center of town. Really convienient for school, which starts in the summer. What reamains to be seen is how conveinient it will be for my job. That’s because I am still searching for the right one. Portland is supremely walkable, bikeable, and public transportation usable, so I think I might be able to get by without buying a car…unless I find a job out in the suburbs. I think I’ve had a cup of coffee every day. Don’t worry.. they all cost less that $2. Tomorrow I’m going to sit in on a marketing class at the university. It’s just a way to stay connected to what’s happening on campus, since my cohort doesn’t start classes until summer. Ok, so it has been a while since I posted last, but I have excuses. First, I spent one more week at the farm, where you read by candlelight, so you can’t even hope to use a computer. Blogs just aren’t much of a priority. Then, I came back to town last Saturday, but I spent my time on the computer buying plane tickets, and then ran out to catch the next bus, so yet again, I didn’t bother to post. I spent the next 3 days on buses. Yes, 3 days. 3 countries. I arrived back in Copan, Honduras late Monday, and now, after “the excitement” I’m ready to fill you in. I decided to go back to the states. Yeah, it’s about 2 months earlier than I originally expected/planned, but I had 2 major revelations. 1. I don’t really like traveling alone. Sure, it’s fun for a short while. Seems like my threshold is about 2 months. 2. It will really be wise to start working again, and stop spending money. Especially with grad school impending, this is quite important. And, I have already learned much more Spanish than I expected to learn in 2 months, so I don’t feel like I’m cheating myself out of that. So, I’m going home. For a week. Then it’s off to Portland to find some sort of a job….but that really is quite a mystery. I told you that I was going to a remote farming village to do a little more Spanish study. I didn´t quite know how remote it was going to be… but it is about as remote as you can imagine. The farming community was established a couple decades ago, during the height of the Sandanista government and ensuing opposition in the early 1980´s. Then the village was attacked by the Contra forces in ´84. There is a very dramatic story associated with that day. The anniversary is New Year´s Eve, and I think I´ll plan to be there then to experience the memorial. This is my bed. 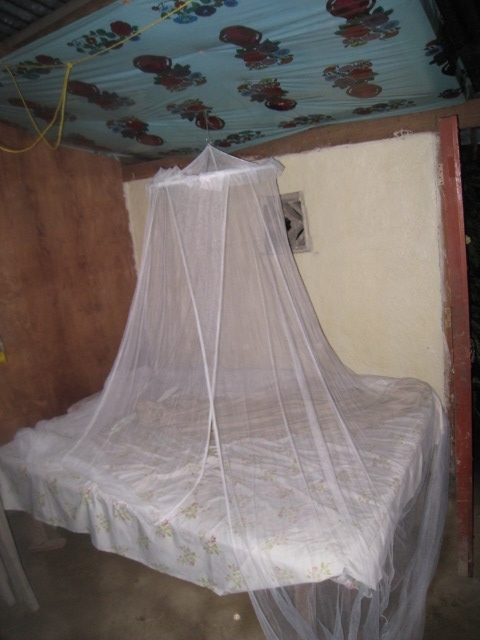 Yeah, there´s a mosquito net. It´s actually pretty uncomfortable to use. You can see that while it is suspended above the bed, it would hang on your head and toes, which is mildly annoying. I´ve probably used it about 1/4 of the time. That is about the extent of ¨comforts¨in Lagartillo. There are no phones, TVs, or plumbing. This means I haven´t had a hot shower since I left the States! Here in Nicaragua, there´s a bucket full of cold water, and a small pail. It does the trick. It turns out I´ve studied most of the grammar in Spanish..that is I´ve seen all the forms and tenses. So I just need to practice speaking as much as possible. I´m getting to do that by spending morning in the local school. Not teaching English, but teaching… in Spanish actually. I´m surprising myself every day. THen in the afternoos is my ¨class time¨which recently has mostly consisted of chatting with my teacher for 3-4 hours about topics ranging from NCLB, to the election, to Korean. He let´s me talk a lot about Korea and Korean.. which is good because I know a fair amount about those topcis, and it is always encouraging to talk about things you know well. Next week I´m planning to work my way towards Costa Rica and Panama, with the goal of seeing the canal. I´m writing this post from Esteli, Nicaragua. 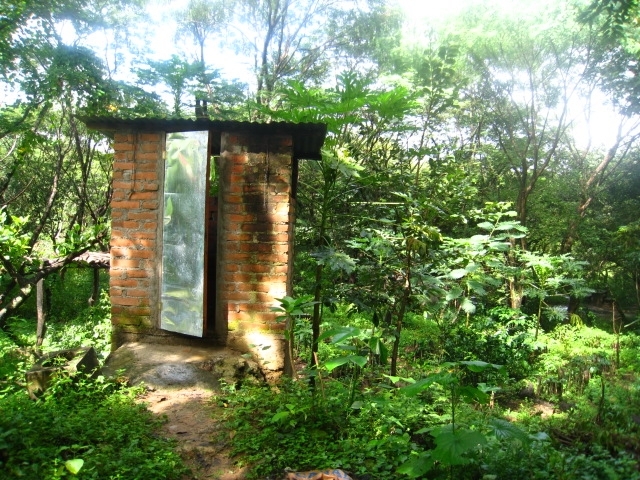 I´ve moved fon from Honduras for now, and plan to spend a month or so here. But, I don´t think I´ll have much internet access. The place bills itself as a remote farming community,and while they have a webpage, (Google ¨hijos del maiz¨) I don´t know if I´ll get many opportunities to update my blog or facebook profile. 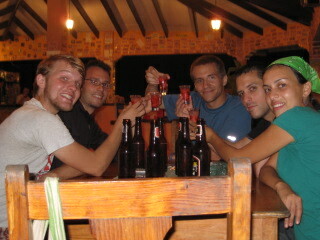 This picture is from my last night in Copán, Honduras. Believe it or not, most of the people around that table are from Portland, or intend to move there next year. You may remember that I´m planning to go to Portland myself early next year. Crazy huh!? Well, I’ve been in Copán for just about 1 week. I’ve had 20 hours of Spanish lessons, eaten lots of refriend beans and tortillas, and been awoken before the sun rose by roosters every day. It has been exciting. The Spanish is coming along. At the moment I am pretty much restricted to the present tense, which while it seems limiting, provides enough challenges. I am living with a local family. I have my own private room and bathroom, and they feed me three times a day. It’s a pretty sweet deal. So far I haven’t done a lot of extra activities. My lessons are in the morning. Starting next week I’ll be going to an orphange in the aftnernoons. That was a big part of my life in Korea, and helped me pick up the language much faster. I’m looking forward to what that will look like here. I’m working on posting other pictures to a more public site but most of the time, it goes frustratingly slow! I’ve done a bit of a re-design here (really just using a different template) to go along with a new chapter in the history of this blog. September 12, I’ll be flying to Honduras to start an immersion Spanish program. I’m going to spend about 4 months travelling around Central America. I will be attending immersion programs in Honduras, Nicaragua, and Guatemala. I intend to take lots of pictures. I have aspirations of posting on this blog. So come on back, put it in your RSS feed. See if I have anyhing for you!